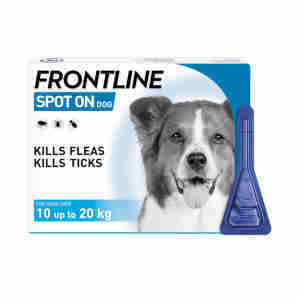 Frontline Spot On for dogs is an effective and easy-to-use treatment for fleas and ticks. The medicine comes inside a pipette, which is then pressed against your dog’s skin at the back of the neck and then again 2 or 3 cm further back to ensure your dog doesn’t lick it off. The natural oils in your dog’s skin then carry the medicine around the rest of their body. Once this is done, your dog can resume all their normal activities (but should avoid swimming or bathing for 48 hours after application) and you can enjoy peace of mind knowing that the problem is taken care of. protects against ticks for up to one month. If your pet picks up any pests from long grass on walks or other animals, it’s best to act as quickly as possible before the problem develops any further – fleas can swiftly spread to the rest of your household. Fleas and ticks attach themselves to your dog’s skin and feed off their blood, causing a lot of irritation and discomfort. If your dog is scratching more than usual or shaking their head often, it’s worth using a flea comb to see if you can find any. Fleas particularly like the warmth of your dog’s armpits, so check there first. It’s also important to inspect your dog regularly for ticks all year-round, but especially in the summer months. Ticks are larger so can often be spotted quite easily and they should be carefully and quickly removed, as they can carry fatal diseases. Use our O’Tom tick remover to safely and painlessly pull ticks of your dog’s fur. Please note: for deliveries to the Republic of Ireland, this product can be only supplied on a veterinary prescription. Fipronil 10% w/v, Butylhydroxyanisole (E320) 0.02% w/v, Butylhydroxytoluene (E321) 0.01% w/v,Non-aqueous vehicle qs to 100%. Protect your dog from fleas by administering this treatment once a month. It is recommended that you also treat your home if your dog has had fleas. This will help to prevent a reinfestation. Great product, does what is says, used it on all our dogs, no problems. I find it much cheaper than my vet, which does the same as what frontline does. This was the first time I used Pet Supermarket for to buy Frontline. It was great service and arrived the next day. Dose exactly what it says on the packet have used this for years with no problems. Good price too. Always pleased with both items service is good and prices excellent.